and do a fast weight loss plan that’s healthy? Currently taking Applications for May start on Tuesday, April 30th. Helping the obese beat obesity is Carlene’s passion. A fast weight loss plan that works for the obese and brings health was a dream come true for her when she lost her weight. And continues for those who follow in her footsteps. 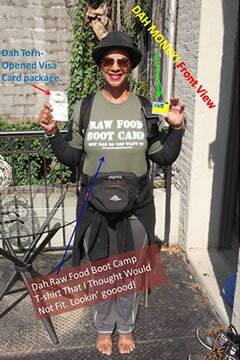 Her Rawk Starz Diva plan is the foundation of what Raw Food Boot Camp is about. This is how Carlene and most of the women in all those before and afters that brought you here lost their weight. It’s a no BS type of program and is only for the truly committed. And only for the obese. You need to lose at least 50 lbs to qualify for our fast weight loss plan. Leader of the Pack, Adiper! A Fast Weight Loss Plan, especially one this strict and structured is not for everyone. Before you apply for Carlene’s Rawk Starz Diva program, peruse the Raw Food Boot Camp website. Take our quizzes, listen to the free audios, maybe even join our Free program. Learn all about us and Carlene. You can read her weight loss story at I Beat Obesity. Our regular side of camp is not this tough and still brings nice fast results depending on how much you put into it. You must do our fast weight loss plan, our Rawk Starz Diet plan as written sans the bananas, grapes and mangoes. And with a max of 300 mg sodium. Through April 2019, those who join this program and have 80+ lbs to lose will be eligible each month with their 10 lbs gone to receive a half off coupon for their membership. You are Eligible and will most likely win our 50 and even 100 lb Challenges which bring free time and $$. Before and Afters Are Starting to Come in Already! Detox happens for everyone. It happens somewhere between day 4 and day 10. It usually presents itself as a cold or the flu. Or you may experience extreme fatigue. Some who have been on heavy meds in their lives may break out with rashes. Most people before starting a diet binge big time. Our diet is low fat and all vegan, so when you come from a high-fat diet to our low-fat diet there is a good chance you may develop gallstones. Make sure to check with your doctor. Gallstones are quite common with dieters. But they need to be managed and watched. The biggest mistake you can make is having a high-fat day before starting our fast weight loss plan. No last hurrahs! Interested in being an RFBC Rawk Starz Diva? Apply for our fast weight loss plan. 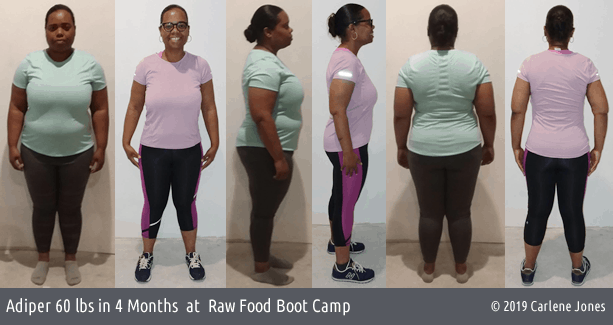 For those who join us in April 2019 and have 80+ lbs to lose, if Carlene accepts you into her program, she will send you a code to get your first month of Access to Carlene at half off. If you complete the first month and participated at least 5 days of each week and lost at least 10 lbs in that month before you renew for the next month she will send you a new coupon. This will continue for as long as you are in the Rawk Starz Diva program. The truth is while we all want fast weight loss, most can't sustain a tough diet and exercise program long term. Answer these questions honestly to make sure the Rawk Starz side of camp is the right one for you. This side of camp is for the morbidly obese only. You have to have 75+ lbs to lose to join it. This is Old style Raw Food Boot Camp, the same one all our 100 lbs in 7 Months Winners went through! To do well in this strict program you really need to embrace the all or nothing mindset. If you can't put blinders on and run for goal, then you will do better in the Change With Carlene side of camp. You can still do the Rawk Starz diet and exercise, just not with as much pressure on yourself to always be so on top of it. Meandering along is the perfect mindset for the regular side of camp. There is push, but not pressure, and trust me, I will do my best to keep that push in your mind so you will have the success you want. You can do the Rawk Starz diet and exercise plan, but then switch it if it gets too hard to a diet of your choice. I'll support you all the way through. It's that resentment and those mindsets that make people quit. The Rawk Starz side of camp is hard, but it's even harder if you resent having to do it or already know you won't stick with it. It is because of this that I created the Change With Carlene program for our regular side of camp. Think hard about what you are truly willing to do to succeed. The Rawk Starz side of camp is an all in type of program. Carlene is going to give you her all, she expects that from you as well. You must treat the program like a part-time job. Be committed, not half committed. Commit and become a Rawk Starz Diva and win your money back by winning our big challenges. Check if you can give up eating out at restaurants except to order plain salad or fruit bowl, regardless. Even if life dictates you have no choice. That means if there's nothing on the menu that you would just order water or tea and sit and be happy. Based on the checklist alone, I agree with you. You probably do have the personality to lose 12-15+ lbs a month on a continual basis in our Rawk Starz side of camp..
On the walking, if you want the big weight loss you may have to push beyond the 2 hours a day more often than not. I got this type of loss but I was doing 2.5 - 3.5 hours a day of hiking. The bigger walking with our strict Rawk Starz diet is what makes these big losses possible. Without your full commitment, Carlene's Rawk Starz Diva program is not right for you. This is truly a boot camp atmosphere with Carlene in drill sergeant mode. The only ones eligible for this program are those who commit 100%. Our regular side of camp is not as strict and may be a better choice. It is important to Carlene that the women and men who join this program are thoroughly committed. For those who are committed to sticking to our Rawk Starz plan, the only deviation being no bananas, no mangoes or grapes. You will be expected to do your best each and every day. You can not take days off. You must participate in our daily discussions daily. No exceptions. No pretending you are sticking to our diet, be ready to face reality. This is boot camp of old. This is how women have won our 50 and 100 lb challenges in the past. When you're done, you have to be committed to transitioning to maintenance with Carlene. I acknowledge that to maintain this membership I must lose at least 10 lbs a month. Carlene may give me a one month reprieve on this, but it will only be once. I agree to do Carlene's Rawk Starz Diet as it is written but with no bananas, grapes or mangoes. I will not deviate. If I have less than 80 lbs to lose, I accept that I will not be eligible for the half off coupon but that I can still do the Access to Carlene and get the Daily with Carlene accountability. And that I still have to maintain the 10 lbs a month loss to continue with the group.